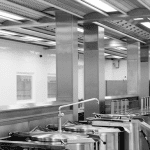 The modern approach for cost saving for utility distribution and equipment flexibility for institutional and commercial cooking equipment. The Service distribution unit is the easiest most versatile means of centralizing connections for the cooking equipment. The SDU is custom designed to suit the equipment, placed in a wall or island arrangement and is integrated into the canopy/ceiling above. T he unit is manufactured entirely from (1.20 mm thick), type 304 stainless steel. All external surfaces are ultrafine grain satin polished, 320 grit. All polished surfaces are clad with polythene protective film. The unit is formed into sub sections and does not require a sub frame. All exposed or accessible metal edges are rolled smooth and is free of sharp edges.The units horizontal raceway incorporates a full length removable top section - hipped to eliminate the unit being used as a storage shelf. This top section can be hinged as an option. The advantage of a removable top section is it provides full access to the integral cable tray.The raceway incorporates the pipe work chamber with internal dividing plate to provide a central fixing point for the services. Access panels are fitted along the length of the piping section.The unit usually consists of two vertical risers and support legs supporting the horizontal raceway every 3000 mm. Each vertical section is mechanically fitted to the floor and extends up to the lower elevation of the ceiling. The piping and wiring the SDU can be provided as an optional service. One of the two vertical risers is used for the electrical part and the second riser for the water, gas, steam or air. The horizontal raceway between the vertical risers house the connections to the equipment.